This book is a very good read for people with absolutely no Puppet experience. You will learn all the basics of Puppet and at the end of the book you can even write your own (basic+) puppet modules. 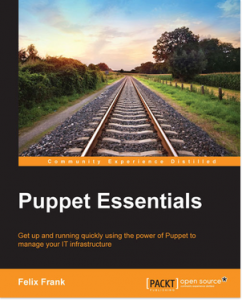 Puppet Essentials starts with an introduction about the basic elements of Puppet. This introduction will give you a very good impression about the power of Puppet and what it can do for your infrastructure. Easy readable examples are making it easy to learn how to create your own modules.